SAN PEDRO – Artist Carl Cheng’s “Ghost Fish 107” sculpture was unveiled Dec. 5 at Sampson Way, at the Port of Los Angeles’ Berth 73. 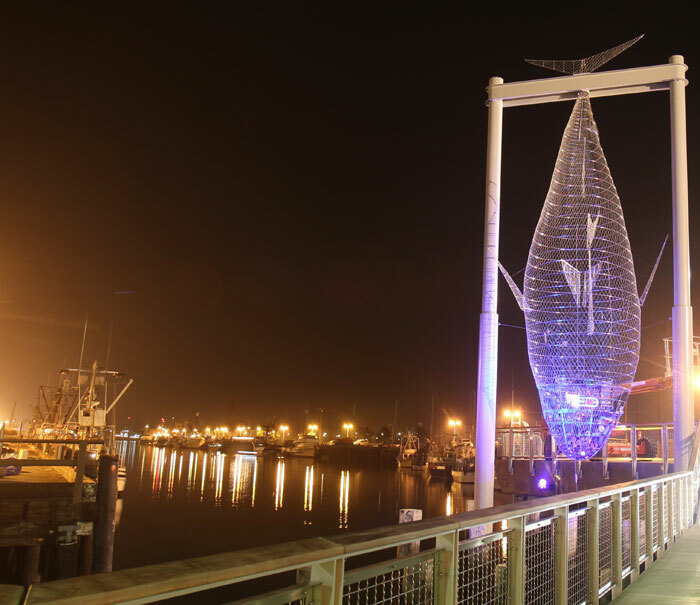 The 40-foot-tall stainless steel sculpture is in the shape of a massive bluefin tuna, and is suspended from a galvanized steel frame on 50-foot pilings. Cheng, who used to paint watercolors along Berth 73 as a high school student, first had the idea of creating “Ghost Fish” in 2007, to serve as an homage to San Pedro’s once-thriving tuna industry. “The large tuna catches during the 1930s by San Pedro and Terminal Island commercial fisherman were the real inspiration behind this piece of art,” Cheng said. The sculpture, with its mesh-net-frame construction, is filled with local fishing artifacts that were donated to Cheng by area anglers and members of the commercial fishing industry. Hooks, fishing reels, buoys, ropes and other old and discarded nautical equipment hang from inside the fish, with a mount of material gathered at the bottom, in the fish’s head. “The local artifacts within the sculpture speak to the historical significance of the fishing industry to San Pedro — then and now,” Cheng said. The sculpture is also equipped with a solar-powered video camera in the fish’s eye that displays each onlooker’s image inside the fish on a video screen. While the sculpture harkens back to the glory days of the area’s fishing past, it also speaks to the current problems plaguing today’s fishing industry. Ghost fishing, for which the sculpture is named, is a term used by the Food and Agriculture Organization to describe lost or abandoned fishing gear that continues to catch fish. “Ghost fishing” is environmentally detrimental and the fish caught is wasted. The sculpture was added as the finishing touch of the new 1.5-acre Southern Pacific Slip landscaped plaza near the intersection of Sampson Way and Berth 73. Cheng was commissioned for the piece by the Port of Los Angeles, as part of the San Pedro Waterfront Redevelopment Plan currently in the works to redevelop the waterfront property around Los Angeles Harbor’s entire main channel. At each new development site, the port is working to create a public art piece. “Ghost Fish 107” will be one of the largest. In addition to the sculpture, the plaza will feature 22 large wooden benches by local San Pedro artist and woodworker Harold Greene. Inspired by historic photos of the San Pedro waterfront in 1910, when ships and wharves were primarily constructed of wood, Greene used sustainable and durable plantation teak from Costa Rica to construct “Narrow Timber,” “Modular” and “Crate” bench designs for the project.